For a long time, I’ve tried my best to avoid the entire “Greatest of All Time” debate. The discussion of anointing any one player as the world’s best ever player is extremely polarizing, so much so that I’ve literally seen a fist fight between friends break out while arguing over the matter. If a mere discussion among friends can lead to such drama, you better believe I’m going to bypass writing down a permanent decision that strangers will have access to and use to judge me in the future. 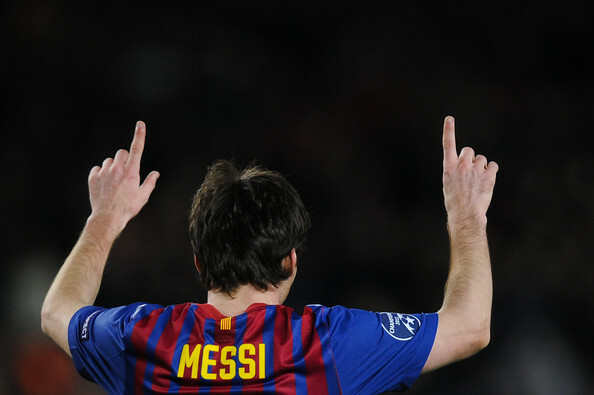 after the performance against bayer leverkusen, leo's practically been anointed by many as the next messiah. But thanks to Lionel Messi’s recent five-goal performance against Bayer Leverkusen in the Champions League Round of 16, the subject has been thrust back to the forefront. And yet as monumental as Leo’s achievement was, I still hesitate to venture down that path. Part of my reasoning for wanting to avoid the matter is personal. Though I harbor no emotional connections to the two players in the current era that most often get dragged into the discussion (Cristiano Ronaldo being the other) I realize that my fondness for Real Madrid likely skews my objectivity. Despite both players putting up numbers so insane that it actually justifies a subscription fee to Opta stats to properly comprehend them, my inherent desire — as a fan, mind you — is to dislike Barcelona players and favor Real’s. Throw in the insecurities caused by a decade of second-fiddle status in the rivalry between Madrid and Barça, and you can see why I fear the discussion from a supporter’s perspective. But the other, more important reason I’ve avoided entering the “world’s greatest ever player” debate is because I think it’s a pretty pointless discussion to begin with. Firstly, it’s just not possible to accurately compare players from different eras. The game changes so much from one to the next, both through rules changes and tactical evolution, that it’s hard to say whether a player player was truly great, or just played in a generally weaker generation. Nevermind that there’s not really enough footage of some of the older players in consideration (Pelé and Alfredo di Stefano) to adequately compare them on video evidence alone. Secondly, the wide adoption and rise of professionalism across globe has also raised the bar for greatness in recent times. In the past, being a dedicated professional or being exceptionally fast or strong could give you a leg up on a competition which included players regularly boozing it up the night before matches and/or partaking in a halftime smoke. But in modern football, the playing field has leveled because everyone is fit… with only a few of the partiers straggling along into modern times. So until someone figures out that whole time travel thing, there’s just no way we would know until we had them playing on the same pitch. 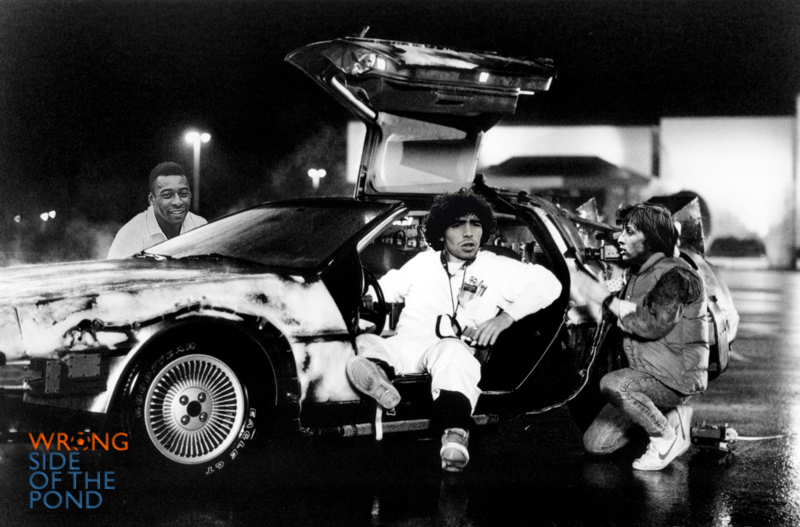 the only way we'd be able to figure out who was the best ever is if doc diego and johan mcfly pick up pelé and come back to the future. Pretending for a second that Doc Brown’s manipulated DeLorean wasn’t just a figment of a plotline from a drawn out 80’s movie series, let’s imagine we would be able to fetch those other players and bring them back in their primes to face up against today’s best defenses. Even then, I just don’t know that’s entirely possible to consider all of the variables to accurately assess what makes one player greater than the next at that level. Highlight reels, goal tallies and trophy cabinets only tell us a portion of the story about a player’s greatness. Numerous other intangibles need to be considered to differentiate them from one another. What kind of teammate was/is he? How good were/are his teammates? Was/is he a leader? What kind of impact did/will he have on the game? Et cetera, et cetera. To put it simply, I think labeling a player as the G.O.A.T. is a pretty subjective conversation. There’s too much to consider, and even if you could, the rose-tinting from observing the game through the lenses of a fan might still taint the decision. Naming just one player is too precise of a task for the human mind to undertake. It’s not as if each player that’s ever been discussed as a potential best ever candidate has played the exact same way. Diego Maradona, Pelé, or Johan Cruyff all played at that level, but each had their own style and unique gifts which we used to categorize them as “the best”. Just the same, each had his own shortcomings. It’s part of the beauty of the game that there’s no defined template or mold in which a player has to fit to be considered special. And the thing we all seem to take for granted in the (somewhat) ongoing debate as to who’s the best player in the world — or ever for that matter — is that some generations come and go without producing a player that can even enter the discussion. So as we squabble with one another over who’s the best, we miss the out on the fact that not only do we have a player that’s capable of joining the penultimate pantheon playing at this time… we actually have two. There’s really no question anymore as to whether or not Messi will join the top pantheon of players. The pint-sized Argentine has given us plenty of reason to contemplate using his name alongside the best ever, and his five goal performance last week underlines that fact. But if we’re using numbers alone to make that call, at the rate Ronaldo is putting up goals himself, he’s has to at least be in line for consideration too, right? And even if he’s doesn’t end up sitting with the exclusive group at the top, at bare minimum you’d have to place him in the rung just below along with greats such as Ferenc Puskás, Eusébio, Zinedine Zidane, Michel Platini, Franz Beckenbauer and Garrincha. both of these men are amazing players. shouldn't that be enough? It’s almost as if they’re two sides to the same coin, each the antithesis of the other. One is pale, the other is tan. Leo is small and stocky, while Cristiano is tall and athletic. Ronaldo is known for his tricks, flash and power, while Messi is known for his vision, touch and poise. Even when looking at their personalities, they’re polar opposites: Leo’s calm, quiet and reserved, while Ronaldo is emotional, egotistical and flamboyant. Depending on how you look at the discussion, you could even say that Messi’s greatness has been partially driven by Ronaldo’s own ambition to be the best. Though neither would probably ever admit it, the pair undoubtedly push themselves to improve upon the other’s amazing performances — though Ronnie normally proves as much by shooting 800 shots-per-game the day after Leo drops a hat-trick. The best comparison of such a phenomenon is the way that Larry Bird and Magic Johnson pushed one another in the NBA during the 80’s… two fantastically talented rivals repeatedly shoving one another towards greatness. Would we be able to truly admire and appreciate each of these great players without having the other to compare him against? I’d venture to say yes, but I doubt our understanding of their greatness wouldn’t be as deep without the contrast between the two. I just feel privileged enough to have been here to witness such a rare, dual occurrence of such talented players. Bottom line and regardless of which player you want to crown as the best, remember that in 20 years we’ll most likely have another player — one unlike we’ve ever seen — who will capture our imaginations and cause us to ponder the great debate all over again. And if we’re really lucky, we’ll get two.